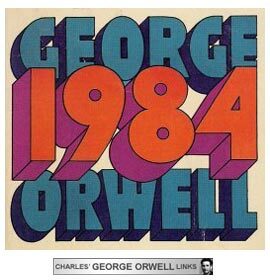 A futuristic tale of what the world is like in 1984 with Big Brother watching and people getting arrested for just thinking something bad and/or going against Big Brother. After finishing it made me very glad that I was not born in the 1984 represented in this book, where children were often taken from their parents and raised in a group home to think pure and live a pure and unquestioning lifestyle to a very extreme sense. The idea that “Big Brother” decides that books and newspapers need to be changed based their beliefs seems so unreal but very futuristic. That with a click of a button history changes to the point where people don’t even remember what day it is or what even really happened in the history books before they were changed. Dictionaries were wittled down to a handful of words that could be used to describe everything, therefore elimitating all elements of impure thoughts and deeds from peoples minds because there is just no word for it. It’s always interesting reading futuristic stories and seeing how different the world really is. In movie form, this would be 2001: A Space Odyssey. While “newspeak” now isn’t how Orwell describes, we still have our own form. Like one review on Amazon says, we have our own version of shorthand with texting abreviations like LOL, L8R, etc. It is nearly the same thing and transforming kids using it, changing their form of dictionary into one that is not recognizable to the older generations. What led you to pick up this book? There has been a lot of hype it seems and a lot of people talking about it. I figured it was about time to pick it up. Plus the title is extra intriguing. Plot summary: Jacob, on his track to becoming a veterinarian and join his father’s practice, when tragedy strikes his family, leaving him alone to pick up the pieces. In a moment of panic, Jacob runs away and ends up joining the circus as the vet, falling in love with a performer and the animals. But, behind the scenes is nothing like he expected and soon Jacob is in the midst of chaos, trying to figure out what he really wants and what he should do, though fearful of the consequences. What did you like most about the book? I thought it was amazing, pretty much everything. The description and storyline go hand in hand and not once was I unsure of what I was shown. Even the most graphic scenes were done tastefully and careful, unoffensive. What did you think of the ending? Perfect ending. Not too rushed or forced. Even from the beginning you could see where the story was going and that there would be no real mystery of secret but just this dramatic piece of work that leads you through a poignant time in one mans life. Do you recommend this book? If you use a rating system, what’s your rating? I’d give it 5 stars and recommend it to anyone. Easy read as well. Mariel suggested this week’s question. I don’t expect my books to stay new. That’s the great part, is the more worn they look the more you know they are loved and read. Some I find are nearly indestructible, others are fragile and even starting to fall apart. A large quantity of books I own are easily replaceable if something was to happen, but even seeing them bent and bruised makes me think they’ve lived a good life. This is my first time participating in this little activity but it sounds fun. I’m not organized enough to have a picture ready this time but I’ll remember it for the future. 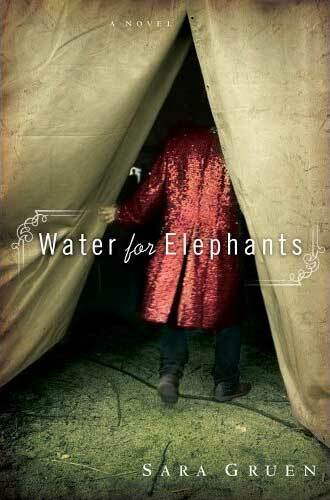 I’m currently reading A is for Alibi and Water For Elephants at home. Online I have been slowly reading 1984. As two of these are library books I hope to have them finished within the next week so they can be returned. While I’m sure I can read more than that in one month, there is a holiday and I may get distracted. This past month I read 24 pieces of work, including short stories, one poem, and multiple Shakespeare plays. Having the Fall Read-A-Thon helped immensely. Of those, my favorites were Wicked, Two For the Dough, and Journals. Most of my reviews have been posted here and can be accessed easily through the reading list link. The two books in progress now, as stated before, I’m reading currently because they are library books but also ones I was very intrigued to start. I’ve never read any of the Alphabet Series and couldn’t resist another challenge. Pretty much all the books I have on my shelves I have probably bought myself. Occasionally I get books as gifts but not as of recent. Harry Potter and the Goblet of Fire is a borrowed book from my best friend. I have reserved it specifically as at home reading because the book is so large I don’t want to carry it around with me in my purse. I usually carry a couple small books around with me wherever I go. I find I am more productive in my reading when I have more books going at once because I can rest on one subject and go another world. When I read one book, I seem to read slower. With multiple books I choose different genres or authors to give me variety. This week, let’s dig into the archives of our fellow Weekly Geeks! Step 1: Choose 3 Weekly Geeks, either from the Mr Linky below or from any of the Mr Linkies in any previous Weekly Geeks, and explore their archives. Try to choose at least one Weekly Geek you don’t know well. Step 2: Looking through some of their oldest posts, find at least one that you really like from each of the three blogs. Step 3: Write a post featuring these 3 bloggers, linking to the posts that you enjoyed, with a short blurb. Step 4: Visit the WG #22 posts of two other Weekly Geeks from the Mr Linky below, and link to their posts at the bottom of yours. Step 5: Come back and sign Mr Linky with the url to your specific WG #22 post, not just your general blog url. I’ve already spent a lot of time going through blogs to come up with three that really jump out at me. 1. 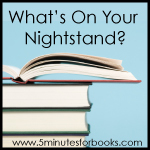 So Many Books, So Little Time: This is one blog I’ve been following for awhile. There isn’t just one post that stands out because I read it so much. But what I love is that I stay up with a lot of the new challenges as alisonwonderland participates in quite a lot of them. I really enjoy finding out what she’s reading and how they are all going. It’s a great motivator. 2. Puss Reboots: This is a new one for me. I found it in the WG#5 archive because it deals with other forms of storytelling. This blogger choose Film Studies which I find extremely interesting since I watched movies about as much or more than I read books. It was fun reading through the posts and seeing the comparisons between movies and books and examples used. 3. 1 More Chapter: Another blog I read on a regular basis. No post in particular stands out, but like #1, I love being updated on new challenges that are found by 3M and seeing how much we have in common with our reading. Finally, here are a couple links to some of this weeks WG’s. I hit up my second book sale, which was successful but not quite as much so as last weeks. Now I’m all covered until spring. 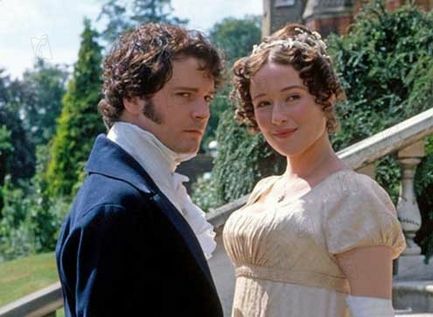 It’s so hard to pick just one couple but the first once that came to mind that I love in the book just as much as I love on screen is Elizabeth Bennett and Mr. Darcy from Pride and Prejudice (and we’re talking Colin Firth Mr. Darcy). I loved the couple and their chemistry but immediate dislike for each other before I even read the book. Once I read the book it brought them even more alive to me. Along those same lines, the relationship between Bridget Jones and Mark Darcy (based on Mr. Darcy) is the more comedic side of this amazing couple. I think they are great on paper and on screen. And on a new note, since I’m not sure where it’s really going, after reading Two for the Dough but Janet Evanovich, I have to say I like the possibility of coupling between Stephanie and Morelli. I have a feeling eventually they were go running into each others arms, but for the time being I can dream.